Artificial Curiosities and Antiquities Of The South Armagh Countryside. According to archaeologists, people had reached Ireland by the end of the Palaeolithic period, or Old Stone Age (i.e. 6000 B.C. ), when small groups of hunters made the short crossing from North-West Britain to North-East Ireland, but there is no evidence that any of these early immigrants came as far as South Armagh (1). At this time Ireland, like the rest of Europe, was covered with thick forest, mainly of pine and birch. These early settlers, dependant on fishing as much as on small game, spread along the coast, venturing inland only along the valleys of rivers, such as the Bann. In Co. Antrim they found abundant flint from which to fashion simple implements, among them small axes and very small delicately-fashioned blades known as microliths (2). During the Neolithic period, or New Stone Age (i.e. 6000 B.C. - 4000 B.C. ), more people sailed to our shores - hunters first, farmers and herdsmen later - and some of these reached, and settled in, South Armagh. These fresh group of settlers brought with them many new ideas and techniques, the most important of which was farming. The crops they grew included wheat and barley. The stock they kept included cattle, pigs, sheep and goats. To provide space for crops and stock, they made clearings in the forest. Business-like axes of polished stone were used. While many different types of stone were used, igneous rocks were preferred, and in particular a stone known as poreellanite. In addition to polished stone axes the Neolithic farmers made and used a range of other tools and implements, such as knives, arrows and javelin-heads, all made of flint. Neolithic dwelling-sites have been found sometimes with the foundations of long, rectangular wood-framed houses, but the earliest evidence of human habitation found in South Armagh, and in particular the Parish of Creggan, is the megalithic, or great stone tombs, of Neolithic times (3). During the Bronze Age period (i.e. 2000 B.C. - 300 B.C. ), a new group of settlers arrived - metal-workers in search of gold and copper, who fashioned the artistic ornaments now in the National Museum in Dublin, the greatest collection of prehistoric gold objects in Western Europe. These were the dominant people ill Ireland in the late Bronze Age. Then the Celts arrived. The Celts had the great advantage for conquest, in that their weapons were made of iron. They seem to have moved into Ireland in two waves, one directly from the Continent, perhaps from Northern Spain or Western France, into the west of the country and the other through Britain (which they had already conquered) into North-West Ireland. They may have begun to arrive as early as 500 B.C. and were well established a century before Christ (4). With their arrival a new era had begun in Ireland. The Picts in the North and the other pre-Celtic peoples left few traces. Apart from the surviving field monuments their legacy is found only in museums. With the Celts it was different. They dominated Ireland for nearly a thousand years and even when challenged by other cultures they were able to resist and absorb them for many centuries more. (5). The structures popularly known as "forts" are at once the most numerous and the most widely distributed of any class of ancient monument in Ireland. A study of the many types of forts is best based on their plans, for the construction depended on physical considerations, while the plans of forts, whether of earth or store, are strikingly similar in most parts of Central Europe and Ireland (6). The material does however provide a basis for segregating forts into two broad classes - earthen and stone-built - which classification is reflected in the popular nomenclature. This classification included numerous variants in the matter of size, nature and complexity of defences, subsidiary structures and other features. Forts are referred to under various Irish terms and these, or Anglicised versions of them, we frequently find incorporated in place-names - "lios", "rath", "cathair", "caiseal" and "dun". Of these "lios" and "rath" are usually applied to earthen forts, while "cathair" and "caiseal" (cashel) are used for stone built examples. "Dun" is less general and tends to occur in place-names to designate large forts, and especially the promontory forts. The words "lios" and "rath" (Anglicised "liss" and "rath") are employed in parts of the country as interchangeable terms to signify an earthen ringfort. A study of the distribution of these words as elements in place-names shows "liss" to occur almost exclusively over the Creggan Upper part of Creggan Parish, while "rath" is less usual. The evidence provided by early texts, however, reveals a distinction now lost and shows that "rath" signified the enclosing bank, while "liss" meant the open space between this and the house within. In places where the use of the Irish words has been abandoned these structures are most frequently referred to as "forts", though the word "mote" is used in some areas. It must however be noted that the popular use of this word is rather indiscriminate and we find that "mote" is applied to various types of earthen structures (7). Estimates of the number of forts of earth and stone in Ireland vary from about 30,000 to over 40,000, the County of Armagh having over 190, covering approximately 8,726 acres. A small number of these exist in the Parish of Creggan but inevitably some have been obliterated by the passing of time and the improving of the land (8). About four miles north of Crossmaglen, in the Parish of Lower Creggan, lies the townland of Kiltybane or Lisleitrim. According to Rev. 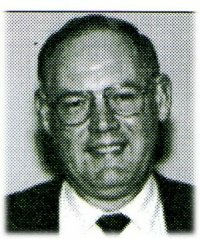 L.P. Murray, an authority on the meanings of local place-names, the townland derives its names from the Irish - "na coillte bana", "the white woods", and "lios liath droma", "the grey fort of the ridge" (9). Lisleitrim is aptly named because on a high hill in the townland stands a two, perhaps, three-ringed fort. Ringed forts may be divided into two classes - ring-forts and hill-forts. Ring-forts were fortified farmsteads, while hill-forts were fortified military forts. Drawing the distinction between the two types of ringed forts, Sean P. O'Riordain, the eminent Irish archaeologist, wrote: "The large majority of forts had no real military significance, but were, rather, the protective structures around early farmsteads. Some measure of defence for the occupying family was provided by the banks and fosses within which also cattle might be brought for safety from wolves. It is possible- that the tops of the earthen ramparts were strengthened by the erection of wooden palisades, but excavation has not given proof of this, due perhaps to the fact that the summits of the banks have been denuded by time, so removing any evidence of settings for the palisades" (10). In its simplest form the ring-fort or enclosure, circular or oval, may be decribed as a space, most frequently circular, surrounded by a bank and fosse. Variants of this type may have two or more walls, or earthworks and fosses up to five and possibly up to seven rings. As already indicated, Lisleitrim is a two, perhaps, three ringed fort. In 1838, John Donaldson, a local historian, wrote a description of Lisleitrim Fort, and although his description is inaccurate in parts, it is interesting nevertheless...... Among the artificial curiosities and antiquities may be reckoned the ancient Danish raths, barrows, or forths, which are to be found in considerable quantities, particularly in the south part of this Barony. These are all circular, some of them are enclosed by one, others by two, and a few have three rings of fosses or mounds of earth cast up to a considerable height, and the intervals, particularly of the latter kind, are sunk in proportion. The most perfect of these is called lisleitrim. .. This fort is enclosed by three ramparts with deep intermediate spaces between them, and a level platform within the centre ring. It is said there was a cave constructed under this platform as a place of security, which is now closed up . . ." In 1940, T.G.F. Paterson, the late Curator of Armagh County Museum, gave this brief description of Lisleitrim Fort: ".. . Treble ringed earthen fort, with very deep entrenchments; about 130yds. in diameter,. 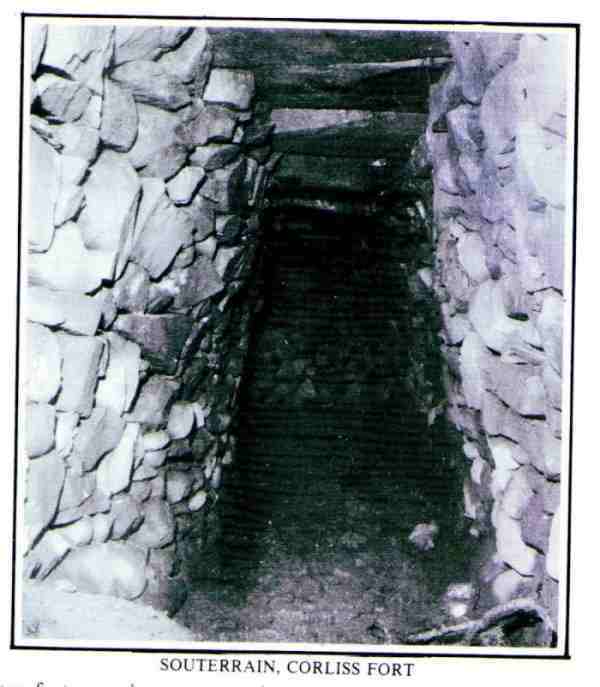 contains a souterrain...... (12). The triple enclosure has been alleged in Ireland to be the mark of a royal fort, but, if so, why have the undoubtedly "royal" forts of Caher Crofinn and Rath Laoghaire at Tara, Emania (Navan Fort) at Armagh and many more not got this distinctive mark? (13). Mrs. Anne Given of the Archaeological Survey, in a letter dated 23-10-198 1, had this to say about Lisleitrim Fort: "Multivallate rath; on a local summit at 50Oft., with. land sloping away N. E. and S.; massive multivallate ringwork; irregular oval in plan, with at least two ditches and two main banks; a slight outer bank is either a relatively modern field boundary or a pointer to a third bank and third ditch; the entrance through the defences is a causeway, at original ground level, narrowing from exterior to interior,. disturbance in part of the interior occurred many years ago; caused by looking for souterrain" (14). The building and occupation of ring-forts extended over a very long period. According to some authorities, ring-forts were first built during the Iron Age, i.e. from about 300 B.C. to about 432 AD However, there is evidence that some ring-forts may have been built during the late Bronze Age. Indeed, there is evidence that ring-forts may have been built, or at least occupied, as late as the 14th. and 15th. centuries. In view of this, and without definite dateable evidence, it is impossible to say when Lisleitrim Fort was built, or who built it. But it is possible that it was one of the early ring-forts of the Iron Age, and that it was built by some of the early Celtic farmers to come to Lower Creggan. South-west of Lisleitrim Fort, lies Lisleitrim Lough, and in its centre is a circular crannog. A crannog - from the Irish word "crann" meaning, tree - is an ancient Irish dwelling-place, and is usually built on an artificial island in a lake, marsh or bog (15). As the name suggests, timber was the main material used in the construction of a crannog, both in the laying-down of the platform which formed the base of the site, and in the palisade which surrounded it. Within the palisade, one or more houses were built " . . . but almost always the crannog was a single homestead, inhabited by one family ... By its nature the crannog implies that the builders were preoccupied with the problem of defending themselves. Access to it was normally by boat, though as times became more settled, causeways and bridges were probably used. (16). In general, crannogs were the equivalent of the ring-forts, though built on lakes and marshes instead of dry land. They afforded a measure of protection, and the economy of life of the inhabitants was similar to that of the fort-dwellers. The builders of a crannog, having selected their site, made the island by laying down layers of various material, of which peat and brushwood were the most usual, though logs, stones, straw, rushes, bracken and animal bones were also used. Pointed timbers were driven in at the edge of the island to form a protective palisade. Others placed in a haphazard fashion served to consolidate the layers of material (17). Lisleitrim Crannog was probably constructed in a somewhat similar manner. In 1838, John Donaldson, the local historian, wrote a description of Lisleitrim Crannog: " . . . In a small island, in a lake .... which is mostly composed of moor and loose gravel, a number of stakes of black oak timber have been found driven into the earth around its confines. A kind of spit for roasting meat and an iron pot of an antique form was discovered in the said island a considerable time ago. Pots of the ' same description have also been discovered in different other places, and even pot-hooks in perfect preservation and free from rust, owing probably to the antiseptic quality of the bogs . . . " (18). From the viewpoint of the excavator, crannogs have an especial importance not possessed by other sites. The moisture which is usual on a crannog tends to preserve objects which would completely decay under drier conditions. Thus the finds from a crannog often includes articles of wood, leather and textiles, and so they give a more complete picture of the everyday life of the inhabitants than is available when all organic materials have disappeared. Apart from the objects found, the evidence from crannogs goes to demonstrate that carpentry of good quality was practised in ancient times - even at an early date. 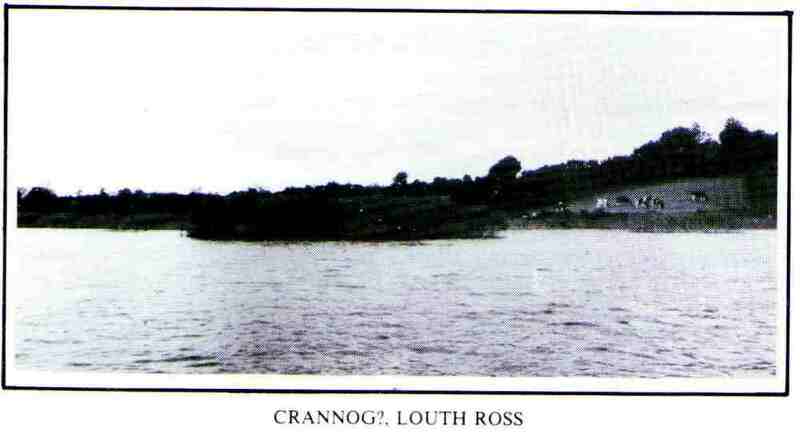 The dating of crannogs covers a range as long as, or even longer, than that of the forts. According to "Recognising Irish Antiquities", a publication of the Archaeological Survey of Northern Ireland, the majority of our crannogs were constructed during the Iron Age, i.e. c.300 B.C. - c.432 AD (19), and if Lisleitrim Crannog is of early origin, perhaps it was built during the Iron Age by some of our early Celtic agricultural ancestors. hundred metres to the south of the island there are two small stony islands visible when the water level of the lough is low, but both seem essentially natural" (21). One of the most impressive raths in South Armagh is that of Corliss, sometimes known as "Donaghy's Fort", as it is within the land owned by a farmer named Donaghy. It is also known as the "Beech Fort" but to locals it is "Corliss Fort". The townland takes its name from this fort and Corliss originally appeared on the 1609 map as "Cornelish"; and despite its present spelling appearing in the 1659 census, the "n" was still used in variations of the name throughout the 17th. century. "Corrlios" means "the round fort". In 1814, the then landlord, Thomas Ball, gave the derivation as being "Cowair" (cobhair), meaning help or protection and "Lis" meaning fort (22). The fort here described lies about 2Y2 miles north-west of Crossmaglen and occupies a prominent position on the top of a hill. It is a fine single-ringed fort, with open souterrain, and is about 40m. (about 131 ft.) in diameter and commands a very extensive view over the countryside all round (23). Two other forts existed in the same townland but one of these seems to have eroded with the passing of time and improving of the land (24). The central area of Corliss fort is relatively level and slightly squarish on plan, 40m. (131 ft.) north-cast-southwest by 39m. (128 ft.) northwest-southwest. Around the north, south and east there is a bank. This varies greatly from a low, sharply-profiled feature on the east to a massive construction standing 1.5m. (5 ft.) above the interior on the north and south. No bank is now visible on the west but there is a steep scarp falling about 2.5m. (8 ft.) to the base of a formidable ditch. sort of timber rivetment which must have increased the strength of the defences still further (25). It seems fairly certain that they contained upright trunks to retain the clay of the bank. They may have been connected by cross-pieces. Earthen banks rivetted with timber have been found on earlier Roman forts and their construction at Corliss may show Roman influence. This would be particularly interesting in view of the Roman prototype of the Black Pig's Dyke and the possibility that Corliss lies on it and is contemporary with it. In the centre of the fort is a well-built souterrain. The boulder walls incline slightly inwards. The roof is of slabs. The two chambers lie at right angles and are separated by a door with projecting jamb and low lintel. A disturbed area just west of the centre gives access to a narrow passage, 0.8m. (2 ft. 8 in.) wide and 1.25m. (4 ft. 1 in.) high, which runs towards the south-west for about 8m. (26 ft.). At the south-west end a single stone-built jamb and low lintel restrict the passage to only about 0.6m. (2 ft.) high and the same in width. Beyond this "creep" the passage turns and continues for a further 6m. (20 ft.) to the north-west. This section is slightly lower and narrower, except at the north-west where it exceeds I m. (3 ft. 3 in.) in width before it terminates in a rounded end. (26). Not every fort contains a souterrain and not all souterrains are enclosed in or connected with forts. In many forts it is possible to surmise that a souterrain exists because subsidence indicates its position and may even show the approximate outline of the structure. The first chamber of the souterrain in Corliss Fort was sunk into till, but towards the end the till is much lower, and apparently the walls were banked up with clay filling which extends approximately level to the edge of the rampart. This indicates that part of the souterrain was constructed above the original ground level. The only dateable finds were part of a pot and two pieces of carved bone. The dozen or so fragments fit together, though broken long ago. The ware is hard, uneven and apparently much sooted. The pot was globular, apparently hand-made and belongs to a well-known class of medieval ware. It may probably be assigned to the 14th. century (27). It is difficult to dissociate Corliss Fort from the dateable finds. Its excellent preservation suggests that it is fairly recent. It would therefore be unwise to consider it as part of the frontier-works known as the Black Pig's Dyke, whatever the course of that earthwork was. 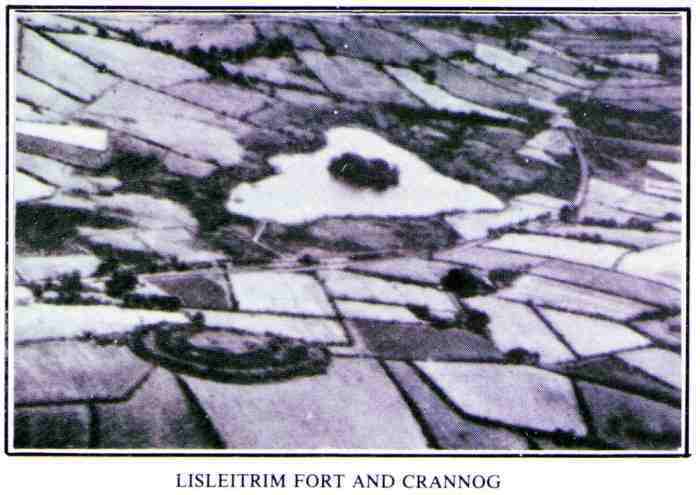 The map of Lisleitrim Fort and Crannog and the aerial photograph of Lisleitrim Fort and Crannog are Crown Copyright and reproduced with the permission of the Controller of Her Majesty's Stationery Office.